One of the ways me as a non Muslim understand Islam is that it is the preeminent political religion. That is why Islam provides for a theocracy. If you project the present trends, eventually enough Muslims will want to live under an Islamic state. What if it was not possible? 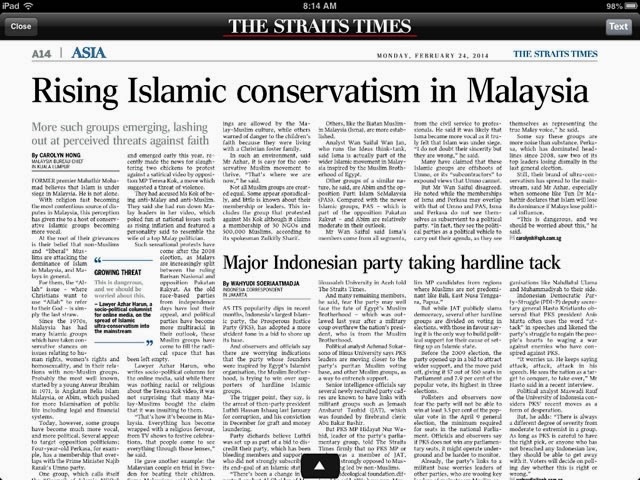 Islam will always be politically managed in Singapore. Can't be helped. We don't want our social environment to be difficult for them to practice their faith. We can be Islam friendly without being an Islamic state. Perhaps this is a key reason why 377A will not be repealed. Pretending it doesn't exist may be the furthest we would ever go. If LGBTs think the Christians are giving them a hard time, there are greater and more dangerous battles beyond. The stakes could be so high that it could destroy this society. So people should think carefully how to rise to this challenge and address it peacefully. LGBT must change their sure lose strategy. Making good progress doesn't mean that the rest of the journey is as easy. LGBT, Christians and Muslims should all be patient. Remember love is patient. For now we should just keep to the status quo.